Unemployment in Scotland fell by 10,000, to 207,000 in the period February to April 2011, according to Office for National Statistics (ONS) data released today. The Scottish unemployment rate is 7.7 per cent, the same as the UK average. The labour market statistics also show employment in Scotland has fallen by 7,000 over the three months to February - April 2011. The number of those in employment in Scotland now stands at 2,473,000. “The fall in unemployment over the three months to April is welcome news but we recognise these are challenging times for the Scottish labour market. The increase in people claiming Jobseekers Allowance is clearly disappointing. “Building on the radical programme of reforms set out in the first Plan for Growth, the Government last week launched the next stage of the Growth Review with one central purpose: creating the right conditions for business to start up, invest, grow and create jobs. Employment in Scotland fell by 7,000 over the quarter, and increased by 43,000 over the year, to stand at 2,473,000. 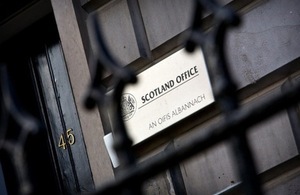 The Scots employment rate remained the same as the previous quarter at 70.9 per cent. The rate is above the UK average of 70.6 per cent. Unemployment in Scotland fell by 10,000 over the quarter. The level now stands at 207,000. At 7.7 per cent, the Scots unemployment rate is same as the average for the whole of the UK. Economic Activity level fell by 16,000 over the quarter and now stands at 2,680,000. The Economic Activity rate fell slightly over the quarter, and stands at 76.9 per cent. In May 2011, the number of people out of work and claiming Jobseekers Allowance (JSA) was 139,300. This represents an increase of 1,200 over the month. The Labour Force Survey (LFS) indicates that the number of people in employment in Scotland from February to April 2011 was 2,473,000. Employment was down by 7,000 compared to the previous three months, and up by 43,000 compared to the same period last year. The employment rate remained the same as the previous quarter, and increased 1.1 per cent over the year, to 70.9 per cent. In comparison, the Scottish employment rate is above the UK average. Unemployment in Scotland was down 10,000 over the quarter February to April 2011, to 207,000. The level was down 10,000 compared to the same quarter last year. The unemployment rate was down 0.3 p.p. from the previous quarter to 7.7 per cent, which is down 0.5 p.p. over the year. The claimant count in Scotland, based on the seasonally adjusted number of people claiming Job Seeker’s Allowance (JSA), increased by 1,200 from April, to 139,300 in May 2011. The level is up by 4,900 on May 2010. The claimant count rate is unchanged over the month at 5.2 per cent, and up by 0.2 p.p. over the year. The number of economically active (defined as those in employment or ILO unemployed, and seasonally adjusted) in Scotland in the February to April 2011 quarter was 2,680,000. This was down 16,000 on the previous quarter, and up 33,000 on the same point a year ago. Among those aged 16-64 the economic activity rate was 76.9 per cent, down 0.3 p.p. on the previous quarter, and up 0.8 p.p. over the year.